This past Friday morning, CERMEL hosted local governmental authorities from the Moyen-Ogooué province in the context of World Malaria Day. 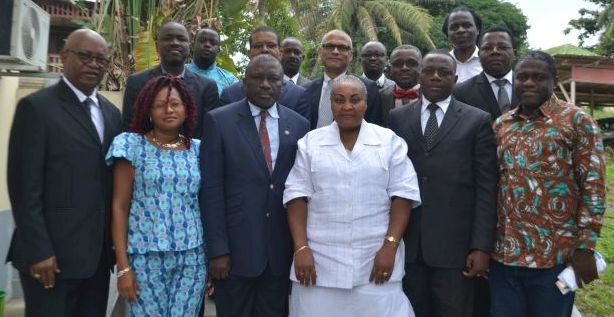 The delegation, consisting of in particular the Prefect of the Ogooué & Lakes Department, the adjunct-mayor of the town of Lambaréné, the regional Director of Health and administrative, judicial and defence- and security authorities, was informed about the efforts taken to combat the disease, both at the global and local levels. The various presentation given by CERMEL researchers also identified current and future issues relating to the campaign against malaria. Each in turn, Dr Maxime AGNANDJI, Dr Ghyslain MOMBO-NGOMA and Mr Terence BOUSSOUGOU SAMBE all highlighted the importance of continuing to invest in research in order to avoid the risk of disease resurgence. In addition to strategic policy, CERMEL continues to lead practical efforts, in particular clinical & fundamental research. These activities take shape on the one hand within ongoing studies on vaccine development and the evaluation of novel treatments and on the other hand in vector control efforts aimed at reducing transmission of the parasites that cause the disease into humans.